If some one had of told me fifteen years ago that most of my favorite journalists, talk radio personalities, and content producers would be other Black millennials, I would have laughed in their face. Yet, here we are and the reality is: Black millennial voices are vast, refreshing, nuanced, and everywhere. Podcasts are a prime example of this sea change. There is something particularly inspiring about being alive at this moment of history. Politically, we are seeing increased calls for governmental accountability to those most marginalized in this society as well as greater visibility for organizers and activists invested in the preservation of Black lives. But, these political shifts have had cultural implications as well. Young Black people, like us, have used social, print, and other web media to challenge a white supremacist status quo and ensure greater access and visibility for Black millennial voices. 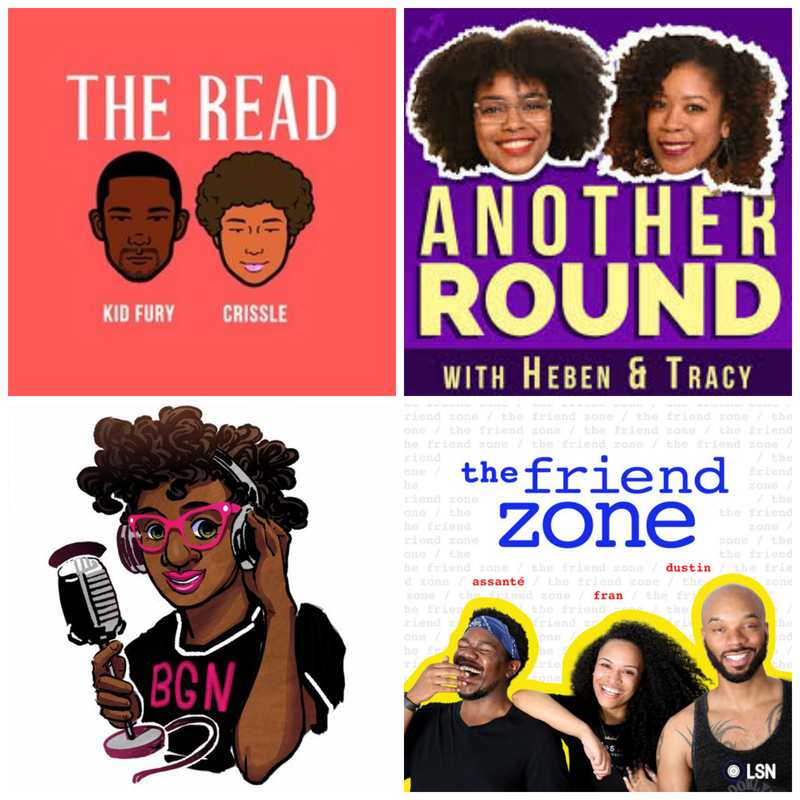 These are some of my favorite podcasts (not all) because they show the complexity of our many Black experiences and make room for Black folx who are up-and-coming to find a place for themselves in the podcasting world. This weekly, shade throwing, pop culture podcast, led by bloggers Kid Fury and Crissle, it the quintessential production for young Black people navigating social life. The two New York transplants are clearly good friends and they cover everything from what happened on this week’s iteration of Real Housewives of Atlanta to pop stars getting into it on Instagram. It is a perfect combination of humor and critique that will keep you listening each week. This podcast is probably one of the funnest experiences you will have listening to a group of genuine friends discussing pop culture, friendships, and daily life. According to their SoundCloud channel, “Dustin Ross, HeyFranHey & Assante explore mental hygiene, because who in the hell wants a musty brain?” The best thing about this show is that there are three hosts with very different perspectives and experiences. It makes for great listening. Heben Nigatu and Tracy Clayton are the hosts of this BuzzFeed podcast, Another Round, where the two drink progressive rounds of alcohol during the show. The great thing about it is both Nigatu and Clayton are already hilarious when they’re sober. You can guess at how funny things get as they increase their inebriation levels. Another cool feature of the show is the star-packed power they have, often interviewing big name folx like Janet Mock, Tichina Arnold, and Melissa Harris-Perry. Jamie Broadnax has been spearheading Black Girl Nerds and is a long time friend of Water Cooler Convos. Her platform dedicated to nerdy Black women has garnered the attention of the likes of Shonda Rhimes and Ava DuVernay (for good reason). It gives a diverse perspective of what it means to be a blerd girl today. Check out these podcasts and look forward to our podcast coming next year! October 8, 2013 Water Cooler Convos is a Black Weblog Awards Finalist!